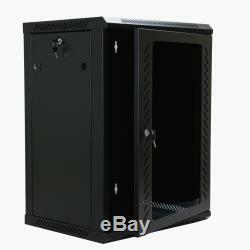 15U Wall Mount Network Server Data Cabinet Enclosure Rack Glass Door Lock w/ Fan. This 450mm depth cabinet by NavePoint is part of the Consumer Series and is suitable for applications where security and accessibility are required and floor space is at a minimum. These cabinets are designed to hold multiple pieces of Network/voice equipment comfortably. Ventilation is provided to allow active equipment to be installed, making it an ideal solution for small LANs, retail units, and remote sites. Dimensions: 29.75" H x 21.5" W x 17.75 D. Rails with cage nut style bolting. Total Usable Space of 13.75 front to back. Reinforced, reversible glass front door with security lock. Removable side panels with security locks. Screw fastened top and bottom removeable brackets for cable and wire access. One (1) Fan (AC 120 V) included. Hardware kit and cage nut kit included. Or you may call toll-free to reach our U. Sorry, no local pickups available. Your satisfaction is important to us. NavePoint stands for value, selection and quality. Our mission is to provide our customers with the best quality products available at the lowest possible prices. Centrally located in the Chicagoland area, NavePoint has quickly evolved from a small in-home business to a powerhouse in the e-commerce space. Please contact our Customer Service department to let us know if there is anything we can do for you. We are committed to your satisfaction! NavePoint is American-owned and operated. The item "15U Wall Mount Network Server Data Cabinet Enclosure Rack Glass Door Lock with Fan" is in sale since Thursday, May 18, 2017. This item is in the category "Computers/Tablets & Networking\Enterprise Networking, Servers\Racks, Chassis & Patch Panels\Rackmount Cabinets & Frames". The seller is "navepoint" and is located in Chicago, IL. This item can be shipped to United States, Canada, United Kingdom, Denmark, Romania, Slovakia, Bulgaria, Czech republic, Finland, Hungary, Latvia, Lithuania, Malta, Estonia, Australia, Greece, Portugal, Cyprus, Slovenia, Japan, China, Sweden, South Korea, Indonesia, Taiwan, South africa, Thailand, Belgium, France, Hong Kong, Ireland, Netherlands, Poland, Spain, Italy, Germany, Austria, Israel, Mexico, New Zealand, Philippines, Singapore, Switzerland, Norway, Saudi arabia, Ukraine, United arab emirates, Qatar, Kuwait, Bahrain, Croatia, Malaysia, Chile, Colombia, Costa rica, Dominican republic, Panama, Trinidad and tobago, Guatemala, El salvador, Honduras, Jamaica.